Evolving standards enable new generations of applications. The fascinating numbers-within-the-numbers for the forecasted growth in Internet of Things (IoT) devices is this: By 2020, it’s estimated there will be nearly 2 billion low-power radio-connected devices, specifically with Bluetooth 5 and 802.15.4 (Zigbee and Thread). Those numbers are compelling because not only is that a quadrupling of the amount of low-power radio devices today, but the value for those devices should, in theory, be greater thanks to that wireless flexibility. We can’t get there by building separate wireless protocol devices for each potential application; that doesn’t scale. But the notion of combining the Bluetooth and 802.15.4 radios on the same piece of silicon does. Remember, wireless IoT devices are going to have to be low-cost if the market is to scale, and that means not only taking advantage of wireless versatility but enabling design flexibility. All Cordio radios are sub-volt implementations that extract more life out of batteries and lend themselves perfectly to energy-harvesting implementations. For sub-volt radio IP, billions of devices need not mean billions of batteries. Users can access Bluetooth and 802.15.4 networks at the same time. Designers do not have to choose the radios to be either an 802.15.4 or Bluetooth part in the factory. ARM Cordio radio IP’s advantage is that it supports simultaneous participation in both WPAN networks–a Bluetooth and a Zigbee/Thread network. This sophisticated implementation is achieved with a smart scheduler switching between the two networks, with time-multiplexed radio operations controlled by software. A fundamental use case for this feature is in the smart home: You can use your smartphone as the remote control to turn on devices and once turned on, the devices talk to each other using mesh on the Thread/Zigbee network. From a technical point of view, the networks are very much distinct, but for the user, it seems that it is simultaneous. Implementing two radios should not mean a doubling in silicon real estate (and a jump in cost). 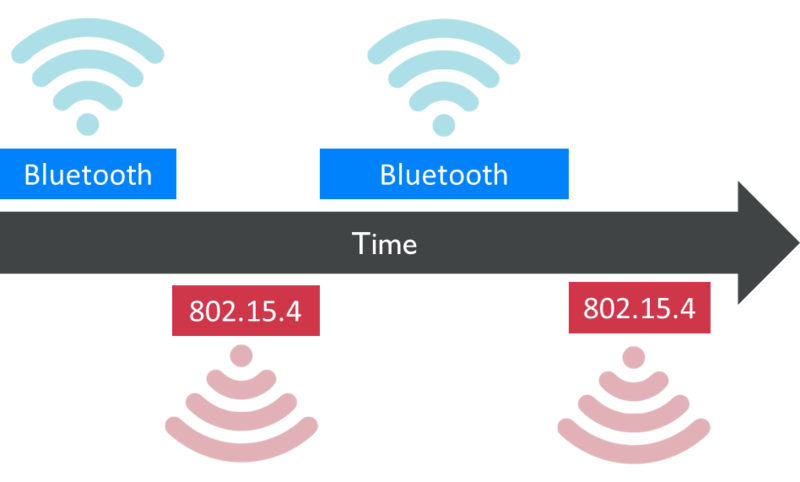 Indeed, simply combining a distinct Bluetooth radio and a distinct 802.15.4 radio in one design does not provide the most area- and power-efficient implementation. The ARM Cordio radio is intelligently re-architected and designed to support both Bluetooth and 802.15.4 standards in the same IP by effectively reusing and sharing certain blocks in the design. The area of the combined solution is just 30% more than a single radio, creating smaller and cheaper devices while supporting several applications thanks to the diversity of low power wireless standards supported. The ability to support multiple data rates – 125 kbps, 500 kbps, 1 Mbps and 2 Mbps. In the Bluetooth mode, Cordio radio is designed with the 1 Mbps modem supporting the data rate outlined in the 4.0/4.2 version of the standard. It also supports the higher data rate of 2 Mbps as outlined in the Bluetooth 5 specification. In addition, it supports the coded PHY implementation for longer-range operations by implementing the lower data rates of 125 kbps and 500 kbps. These changes affect the transceiver as well as the modem and are designed with the lowest area overhead while maximizing performance. Ability to run both Zigbee and Thread stacks. 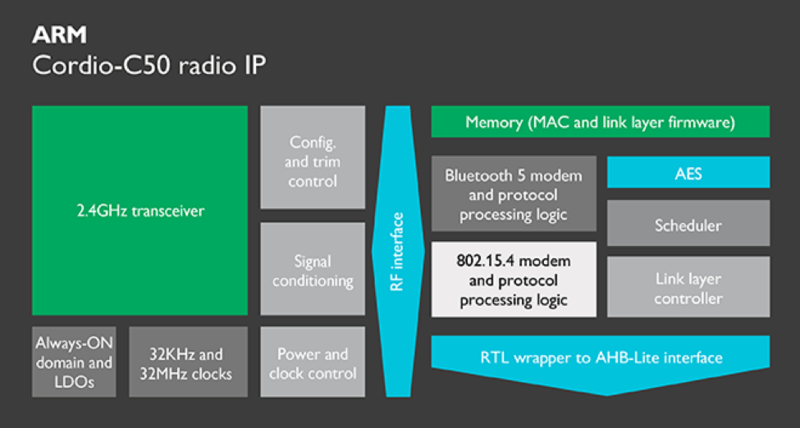 The 802.15.4 block of the Cordio radio IP is versatile. The IEEE 802.15.4 standard defines the MAC and PHY layers and makes specific features of the MAC accessible for the upper layer stacks. The Cordio IP supports all the common features to send and receive data over a Zigbee and Thread stack (e.g.scan, data send and receive, and data poll). In addition, it also supports features unique to ZigBee stacks such as association and disassociation which are used to join or leave a network. Further, it supports security features that are required to implement the Thread stack targeting the home market. Evolving standards tend to enable new generations of applications, especially in IoT. And application needs require flexible architecture and design trade-offs. Ultra low-power standards coupled with efficient radio IP will unlock the potential of this market and perhaps even make those 2020 forecast numbers look conservative when all is said and done. For more information, check out ARM’s webinar on how engineers can add Bluetooth 5 and 802.15.4 to their next SoC with ARM Cordio radio IP.